Cooking isn’t all or nothing. I can’t tell you how many times I have been told that someone thinks they could never make a dish that I have shared because it is too difficult. Here is a not so little secret: very few things that I make are difficult. And, if they are, there better be a darn good reason for it, or it just isn’t going to happen. I am lazy. I like good food, but I am not willing to give up my life for it. I will not be shackled in the kitchen and chained to the stove. Just as all of you, I have work and responsibilities and many demands on my time. The last thing that I want is to sully the pleasure of food with the drudgery of endless hours of labor. I take shortcuts. I have shared some easy Cinnamon Biscuits made with baking mix. We love Peanut Butter Brownies that start with a box base. And while there is nothing like fresh pasta, one of our favorite special meals involves egg roll wrappers as a substitute in the cannelloni. I also lean to the convenience of wonton wrappers when I want to make quick ravioli. When filled with a delicious savory mixture of spinach, herbs and cream cheese, then simmered briefly, the wontons become a tender and delicious “pasta.” Heating a jar of pasta sauce (I use home-canned, but whatever favorite is in your pantry will work) to ladle over these pillows of creamy spinach and grating a little parmesan creates a fresh dinner that truly was super easy but looks and tastes impressive. In a large skillet, heat 1 tablespoon of olive oil. Add the onion and cook, stirring until translucent. Add the garlic and cook another 45 seconds or so. If necessary, add a bit more oil and then the spinach. Toss the spinach to coat and then cover to allow it to cook and wilt down. If the spinach releases a lot of moisture, stir and cook with the lid off after wilted to allow the excess to evaporate. After all excess water is cooked off, stir in the softened cream cheese and 1/2 cup of Parmesan cheese. Season with salt and pepper. Lay a few wonton wrappers on a cutting board; place 1 tablespoon of spinach filling in the center of each. Working one at a time, moisten the edges with water and lay another wrapper on top; seal the edges, pressing out any air. 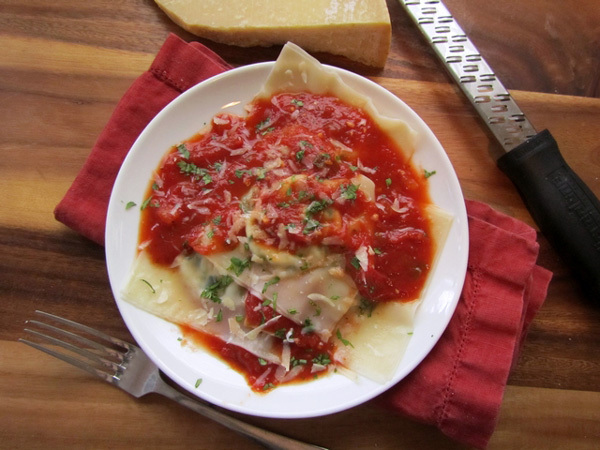 (Air trapped with the filling may cause the ravioli to burst during simmering.) Repeat with the remaining wrappers and spinach filling. Bring 1 cup of water, a drizzle of olive oil, and a pinch of salt to boil in a large shallow skillet. Add the ravioli a few at a time and cook until tender, about 3 minutes. Transfer to a platter and repeat with the remaining ravioli.